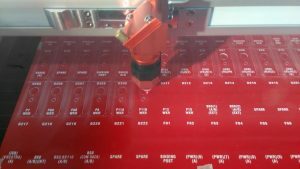 Laser engraving – increasing accuracy and speed whilst reducing the cost! With our new Trotec Speedy 400 CO2 laser engraver we can now work with a wide range of materials in a more cost effective way. The machine will allow us to cut and engrave many items without the need to move the product between departments. We can produce text or images direct from customer drawings and cut finished items complete in a range of materials, increasing speed and ensuring complete accuracy. Laser technology and specialist materials also allow a more cost effective solution to engraving stainless steel items by applying a ceramic based product and fusing it into the surface of the stainless using the laser. This finish is extremely durable & resilient and has been proven in the field. We will be taking advantage ourselves in producing large acrylic characters for our own building signage.